Everyone loves Apple cake or Apple pie. And Walnuts and Apples go together wonderfully. This is a gluten free and egg free Walnut-Apple Cake. Mix the sugar, vanilla sugar, butter and egg in a big bowl until it’s fluffy. Mix flour and baking soda and sift it into the bowl. Add walnuts. Knead it into a dough with your hands, but not for too long. Peel the apples and cut them into slices, then fan them out on the dough. Preheat the oven at 165°C. Heat the butter in a small pot, then add the sugar, tigernuts and cream. Stir until it’s mixed, then add the flour. Mix until it’s even, then spread it over the cake with a table spoon. 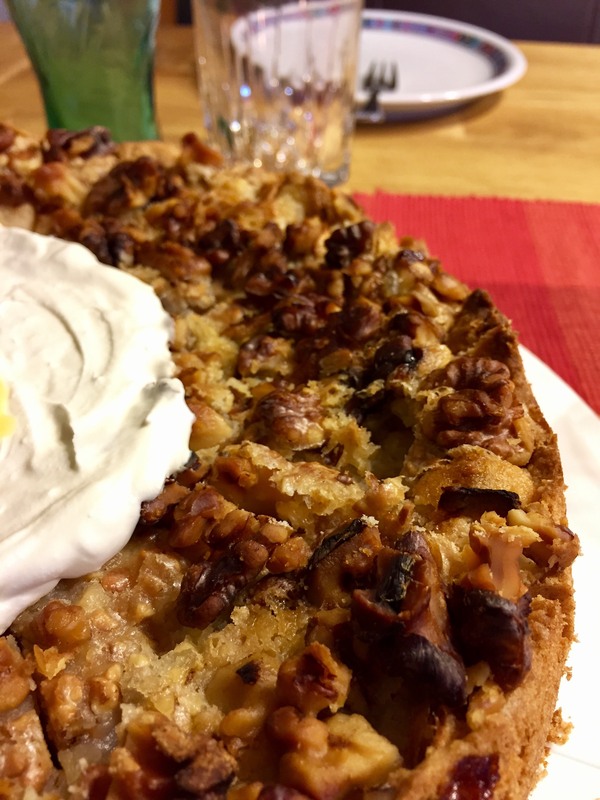 Break the walnuts lightly with a table spoon, then scatter them over the cake. Bake for 45min in the middle. After 45 poke it with a knife. If there is cake batter on the knife when you pull it out, bake it for another 5-10 minutes.